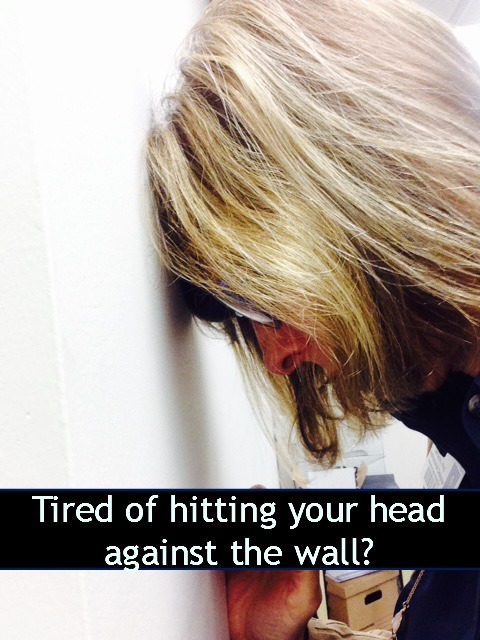 There is an alternative to hitting your head against the wall. Last Tuesday morning I had a meeting downtown early. Downtown Charleston being what it is, alluring and dicey for parking, I decided to take the Express bus, otherwise known as the Mensa bus. Mensa because almost everyone on it is either a student or employee of College of Charleston or the Medical University of South Carolina. I got to the parking place in plenty of time. Jumping out to get my gear, the door weirdly shut and locked. (Weird because I thought I hit UN-lock!) There I was, at Wal-Mart parking lot at 6:45 am. I gazed longingly at my purse, gym bag, laptop and cell phone, all beyond the door, as the bus came and left. It would not take much for this to parlay from an inconvenience to a series of unfortunate events. So I asked myself, does this mean I should go home and start over? I have learned, through coaching and earning my PhD in Mistakes Made, that getting what you want in life has a lot to do with asking the right questions. Wrong questions cannot bring you what you want. How can such arrogance and ignorance exist in the same body? Why is s/he such a jerk? What’s the best direction for your team now? How can you jumpstart That Project? How can you get your team members to play better together? :: How can you make this work space more inviting, tranquil, private, stimulating? :: How can you add more value to this project or company or team? :: What do you need at this very moment to be at your best? :: How can you better support your team? :: What does this business/project need from you? :: How can this job fit into 40 hours/week….or less? :: What is the underlying fear being expressed? :: What do you want to see in this person? ::How can you make this thing (directive, project, new protocol) work for you? :: What can you stop doing? :: How can you bring passion to what you’re doing? Anytime you’re stuck or frustrated, get out some paper and write down some questions. Your hand is connected to your heart and you might be surprised at how the fresh perspectives help you. Questions make up yet another powerful communication tool in your quiver. Use it. In the case of my locked car in the parking lot, I was able to call Ruben from Wal-Mart and he rescued me in time to catch the next bus. When my 8 o’clock meeting cancelled at the very last minute, I laughed.